It took me five whole days to recover from my journey to my muse! But I didn't let the muse infusion hamper my writing. When I am not talking nonstop with friends on one of these trips, I'm being aware. I write down the things that catch my eye (so they don't escape my sieve-like brain) and I try to be alert of the opportunities to gather material. For example, the passages in In Between Goodbyes that relate to walking in NYC are all gleaned from my experiences in the City. Yet, for a moment, his eye was drawn to the street and a redhead, her head inclined toward her walking companion and the both of them leaning into the sharp wind off the Hudson. There's nothing like walking in absolute frigid weather in the city. Just when you think the wind has calmed and the sky looks a little bluer, you come to a cross-street intersection and the blast wipes you out, bringing tears to your eyes and carrying away anything you haven't nailed to your body. Following a full two minutes of bruising her knuckles, she laid back against the tan brick wall next to the entrance to catch her breath and watch assorted discarded papers making their solitary way from last night’s excitement in Times Square down 45th Street to their eventual demise at the hands of the street cleaner on 8th Avenue. Paper takes on a life of its own in this windy world, it becomes animated and joins other discards in a ballet of the forgotten. Observing it makes writing more vivid. Sometimes I hardly know how I can survive in the biting winter in the City. Sometimes I'm not sure how I'd survive in this pseudo country sitting where I live without my trips to the City. I went away this weekend to meet my muse. No my muse isn't a single person but rather a City and an amorphous place. Broadway, New York. I spent Saturday afternoon at a legitimate play and Saturday evening at a concert by a broadway performer. These things are the things that charge up a writer, they make me more aware of who I am and what makes me tick. I save my funds to be there and come home eager to type my brains out. So I re-examined my motives for publishing. Was it to be on the best-seller list? Well I’d certainly love that but it wasn’t the reason I write. I write because I have to. I have a pension, and (as of next month) I have social security. I have a little job at the hospital and a nice volunteer job at Therapeutic Riding. While I’d love the money from a best-seller, I’m not sure I’d like the fame and the work. I examined the current publishing industry. Certainly an up-front advance would be nice but, more and more the industry is giving smaller advances to first time authors and requiring more and more that they do their own publicity. What is my goal? Well it certainly isn't being snubbed by the “in” girls while trying to get into the industry. It wasn’t doing my own publicity after I had spent a year blowing my own horn to get the book published in the first place. It wasn’t being out of control of my own book with regard to when and where it was in print. But I don’t have the money for vanity or subsidy publishing. Then one day I stumbled upon LuLu.com. Voila! The new self-publishing. I could see my book in print and sell the book with any type publicity I chose. Now how do I do this? I said I’d talk a bit about why I chose to self- publish. The primary reason is that I truly believe that this is the way of the future for at least a first time author and perhaps for everyone, not sure of the latter. I’ve read all the pros and cons. I’ve tested some of the waters and, for me, this was the best option. Let me qualify some of that statement. First of all, I write because I have to. Those people you see on the paper float around my brain and demand to speak. Articulate or not they ask to be written down. Various versions of them have run about my head since I was about 14. Not necessarily the characters in IBG, back then it was a movie star turned infantryman in WWII and a couple of young nurses. At any rate, they have demanded to be written down and I do so. In the past they have gotten moldy in my closet and eventually thrown out. One of my stories has been around since the early 90’s and will eventually get to print. One story started talking to me last night in the bathtub (ever try to jot down notes under a foot of water?). IBG started about 4 years ago and came to a final form during NaNoWriMo in 2007. What’s NaNoWriMo? That’s a topic for another post but Google it for now and there’s plenty on their site to get you going. I did the requisite mailings to selected agents and publishers. Only one asked for a full and then rejected. Most rejected on the strength of various iterations of my query pitch. I’m easily intimidated. They scare me. But when I thought about it the whole thing was just another batch of kids from grade school telling me that I wasn’t as good as them and I got mad. They may have their place with bigger egos than mine but I wanted a safe place. 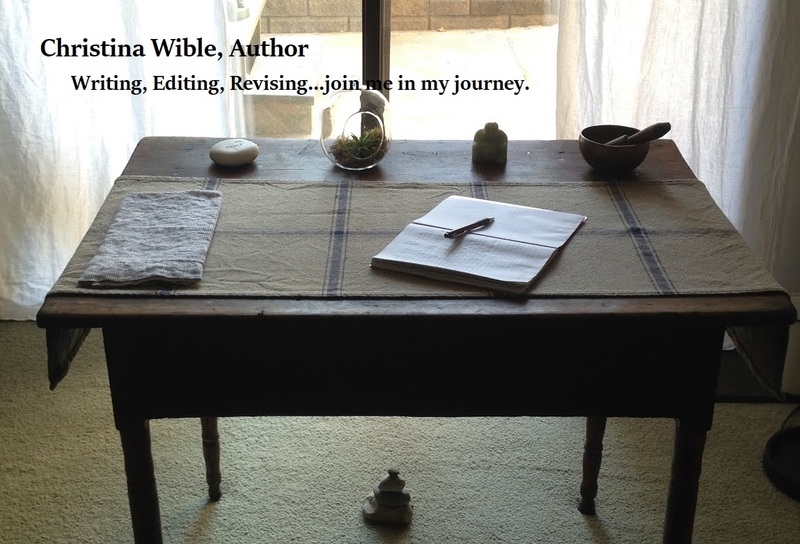 Perhaps publishing wasn’t it for me but perhaps there was a space where I could survive. Today, In Between Goodbyes, showed up on Amazon.com. I'm ecstatic, humble, proud and scared all at once. This is my first effort at publication though not my first at writing a novel. This week I'll post on why I used self-publishing, why I prefer it, but right now I want to savor the idea of being published. Just getting uptown on foot in this weather was a struggle against the elements. To top it off, the gray steel door of the theater was unwilling to yield to Hope’s two-fisted hammering. Following a full two minutes of bruising her knuckles, she laid back against the tan brick wall next to the entrance to catch her breath and watch assorted discarded papers making their solitary way from last night’s excitement in Times Square down 45th Street to their eventual demise at the hands of the street cleaner on 8th Avenue. She looked up to the back marquee of the theater. A paper blew up in the air and covered the S in the name of the play, Savage Winter. and thought, “Easy for you to say.” Lifting her fist, she shook it once at the sign and found instead that she was saluting the unshaven face of Alvin the doorman. “And a lovely good morning to you, too, Miss Grumpy. Haven’t seen you at this theater in a few years,” he greeted her, holding the door open just far enough so she would have to slide against him to get in. She provided him with a sharp elbow as she passed, but instead of descending to her old home in the basement or going up to her new home on the third floor, she pushed through the dusty brown curtain to the right, stumbled down three stairs so old they were held together with duct tape, and entered the world of the theatergoer, so different from her world of theater crew. Careful not to touch the smudged brass handrail (it was flu season), she climbed and climbed the brown-carpeted stairs until she reached the gods, the very top of the mezzanine, and landed with a thump in a seat built for short-legged high fashion models. For one moment she wondered if anyone would notice in the dinginess of the gods if she dumped her overfilled tea cup on the carpet, but instead she settled back in the dark to revel for just a few moments in the pomposity that was this old lady of a theater. Built in the 1920s, in a time already way past the excesses of the Victorian era, it nevertheless pretended to an opulence to which it had no right. There were too many layers of cream paint alternating with chips out of the plaster walls, too many threadbare spots on the chair upholstery, and too many fingerprints on the brass handrails. Still, the out-of-towners would be there to be dazzled by what happened on the stage, and their cursory glances at the décor wouldn’t surface the holes in the old lady’s façade. But for her, the lady was just as fake as she felt, and she imagined a certain camaraderie with the theater’s frayed edges and crumbling cornices. Someone at the console threw a spot from above on the table in the middle of the stage, and she noticed that from the gods you could see the white tape marks on the worn black floorboards downstage. She leaned against the sprung back cushions of the chair in front of her and watched the dust motes rise through the strong rays emanating from the powerful lamp until she was called down to the stage by Jarrod. I've waited a lifetime for this moment, the one in which one of my dreams comes to fruition, to take the people who speak to me and turn their story into a novel. I know, I know, I don't always have voices talking to me. But I've been listening to the stories in my head since I was 14. I've been diligently writing them down, then tearing them up and discarding them. 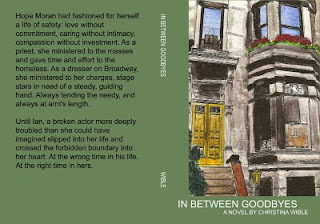 With the publication of In Between Goodbyes, I finally get to see the story of two of my in-head protagonists available for others to read. Stay tuned here to learn when and where Ian and Hope will finally see the light of ...well, paper.